Congratulations Adrea, Owen's mom! 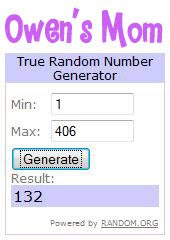 You're the winner of the Knickernappies 2G Diaper with LoopyDo insert! Thanks so much for entering our giveaway and we hope you enjoy your fluffy new prize! Please contact us or look for an email from us to claim your prize. Thank you so much! I just sent you an email. Thank you, thank you! I've never used a knickernappies dipe but the Loopy do inserts ROCK!